1. If you have a Wifi router, check that it’s connected to power and that the activity lights are on. Restarting the router by powering it off and on again will often restore service. 2. Try bypassing the Wifi unit by connecting the LAN cable from the black POE injector directly to your computer and try the internet again. 3. Check that the power is connected to the rooftop Gisborne Net Microwave unit. 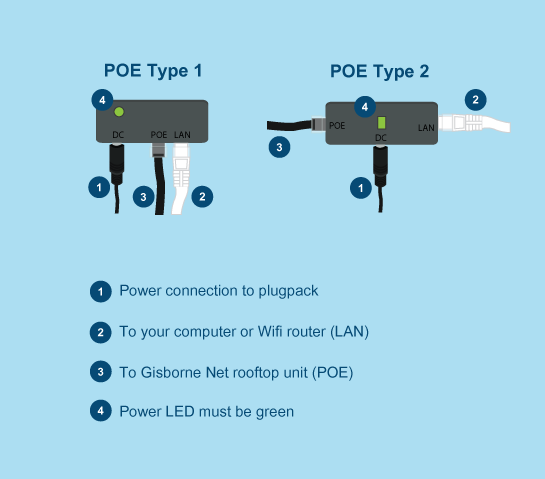 You will have a black POE injector connected to the black cable coming from the rooftop unit. Check that the green LED on the POE injector is lit. 4. 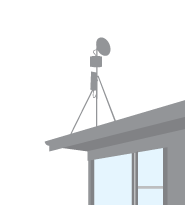 Reset the rooflot unit by removing the power connector from the POE unit momentarily and then reconnecting it. The unit will take about 3 minutes to restart. Then try reconnecting to the unit.